Below is the Official Nominating Report/State of Officers for MONAHRO for the upcoming term October 2019 – September 2021. In accordance with our By-Laws, additional nominations to office may be made from the membership by petition which shall bear the name of the nominee and the signature of at least ten (10) associate members of ten (10) active agency or affiliate members in good standing, and further, that the petition is received by the Secretary, who shall certify the petition, at least twenty (20) calendar days before the meeting. 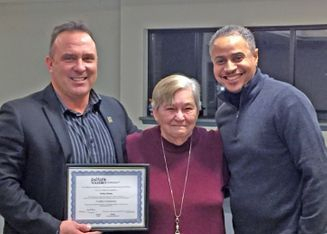 Kathy Kelsey, resident commissioner for Lee’s Summit Housing Authority (LSHA), has received a certificate from the National Association of Housing and Redevelopment Officials (NAHRO). The recognition shows that Kelsey has completed their accreditation course and has received the status of certified commissioner. Kelsey is the second certified commissioner on the five-member board, joining Syrtiller Kabat. She’s been with the housing authority for three years and previously managed apartment and HUD (Housing and Urban Development) properties for more than 20 years. She hopes that Lee’s Summit prioritizes affordable housing to allow all, including seniors, teachers, first responders and young professionals, to live within the city, especially when they grew up or work here. Kelsey has been taking accreditation classes for about three years. She says continuing education is important and that at age 73, she’s just a young pup with no plans to stop learning. She thanked Darrin Taylor, executive director at LSHA, for his support, saying that she wouldn’t have made it through all the classes without him. “We are especially proud of her accomplishment,” Taylor said. Kelsey was presented with a framed certificate and a letter from NAHRO at LSHA’s Jan. 2 meeting. Mayor Bill Baird attended to congratulate her on the recognition.